The linear system of production is not sustainable for a planet with a growing population and limited resources. Linear production is inherently inefficient and wasteful, and limits relationships to singular transactions. In a circular system, however, materials are used again and again, and old products are kept in circulation as long as possible or are turned into new ones, generating very little waste. Circular business models present an opportunity for VF to unlock new revenue streams for our brands while continually and meaningfully cutting our environmental impact. They enable us to build better products, extend product life, transform transactions into deeper relationships, and turn waste into value. The apparel industry is no stranger to circular systems. But at VF, our approach is a little different. We believe there’s more to circular than recycling, which is why we’re focused on three areas that sit at the intersection of what our consumers want, what environmental constraints demand, and where we’ve identified untapped business opportunity: Recommerce, Rental and Circular Design. In apparel, these business models are already proving to be successful. U.S. apparel resale, an $18B industry today, is expected to grow to $33B by 2021. Meanwhile, apparel rental is already a first choice for many consumers. Building circular products and systems requires us to disrupt current processes and push ourselves to think differently. And this shift in approach has the potential to result in more innovative products and better consumer experiences. Our ambition is to use our scale to lead the apparel and footwear industry in the transition from linear to circular. We will make second-life apparel second nature for consumers. Shifting consumer preferences and smart use of online platforms are fueling an invigorated online second-hand clothing market that is growing four times the rate of the total apparel sector. Recommerce presents a large and vibrant resale market for VF’s brands – a market that could add new revenue streams to complement our existing sales models and channels. Recommerce can also encourage new consumers to experience our iconic brands and allow them to access high-quality products at lower price points. By reselling used products, we can dramatically reduce our environmental footprint while enabling consumers to reduce theirs. We’ve partnered with the World Resources Institute (WRI) on a project to quantify the exact impact of our products’ second life. Ultimately, we strive to establish an industry standard for quantifying the impacts of recommerce. Doing so will allow us to clearly and accurately track the contribution of our recommerce and rental businesses to our overall climate and materials goals. Rented apparel is popular among many consumers and the category continues to grow in popularity. This growth – combined with the significantly lower environmental impact of using rented products versus purchasing new ones – makes delivering high-quality products through an easy rental experience an important component of our circular vision. In certain categories rental is not just a great way to help consumers shrink their personal footprint, it also provides them with opportunities to try new sports or activities without the commitment and expense of purchasing and owning the appropriate apparel or equipment. One of the primary reasons more products aren’t kept in circulation is that they weren’t designed to be circular. 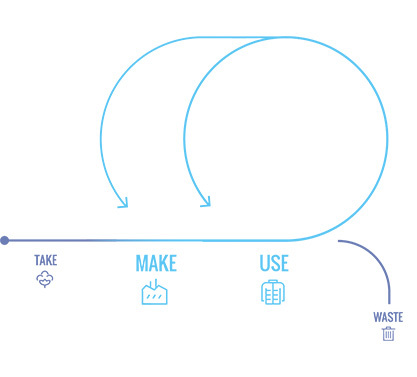 We’re working to address this dilemma with the third priority in our new Made for Change circular strategy: building the systems to provoke more circular design. Our actions are in early stages and we have much to pilot, learn and scale. We will use these pages to share stories of our journey to build a circular future. Our ambition to be a leader in the move to a circular economy is audacious given the traditional model of our industry – and it will require strategic alliances with committed and like-minded partners to get there. We’re already working closely with several organizations, including the Retail Industry Leaders Association [RILA]’s Sustainability Initiative, the U.S. Chamber of Commerce Foundation and WRI to help inform our work. There will be more to come.